Furnishing Solutions would love the opportunity to create an unique interior space for you based on your own individual style. We believe that great design should reflect your personal taste while functioning to fit your lifestyle. We offer two services to best suite your needs. Furnishing Solutions works with you and your builder to select materials, paint, lighting, cabinetry, tile, flooring, and hard surfaces. Or, Furnishing Solutions will work with your existing household furniture and accessories to recreate or stage a fresh new look. This does not include any purchases made through Furnishing Solutions. Furnishing Solutions charges an initial consultation of $175 which includes approximately 1 hour in-home meeting to discuss your design needs. This design fee includes all materials purchased through Furnishing Solutions. Furnishing Solutions will implement a turn-key project specialized for you. This will include all custom selections, the scheduling of subcontractors and overseeing the project. 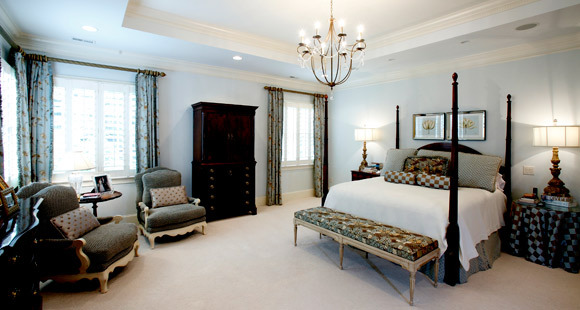 Furnishing Solutions will give you an estimate and time-line based on the concept proposed. "After hiring Furnishing Solutions eleven years ago to help me decorate my 1949 built home, we chose a wonderful collection of bold colors, fabrics, and furniture. Now that the kids are grown and gone, we were ready for a big change. Once again, Marian Harrison at Furnishing Solutions helped me bring my vision to life with a new color scheme, fresh window treatments and furnishings, a totally different look. We are thrilled with our new "adult" house. I surely recommend using the girls at Furnishing Solutions. They will keep you from making costly mistakes." "Furnishing Solutions has a wide range of fabrics and furnishings that inspire me each time I visit the showroom. I am a long-time, satisfied customer who enjoys keeping my home décor updated and welcoming, but not too trendy. I especially appreciate Susan’s ability to help me make the most of my existing furnishings while sparking interest with fresh new pieces. Working with Furnishing Solutions and Susan, I’m confident of success!" "Furnishing Solutions was an amazing resource during our home remodel. Marian spent countless hours with us in the selection process looking for tile, granite, hardware, lighting, carpet, paint colors, fabrics, furniture, etc. The selection process would have been overwhelming without Marian's experience and knowledge. Furnishing Solutions made the process fun and ensured everything we selected would go together well and flow in the house. Marian helped find selections I wouldn't have chosen on my own that look perfect in the house. Her advice was invaluable in making our remodel a success."